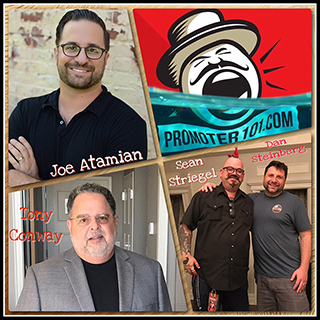 This week on Promoter101 The Podcast # 57 – Paradigm Talent Agency's Joe Atamian the agent behind Anderson East, Big Gigantic, Sturgill Simpson and The Lumineers talking about the amazing run of success he is enjoying. Live Nation Concerts New York's Sean Striegel shares his path from booking punk rock club shows in SoCal to the Arena's on NYC. This week's War Story is from the legendary Tony Conway. Plus Oak View Group and Pollstar's Ray Waddell drops by to discuss the News of the Week with Dan Steinberg and Luke Pierce.